Jim Hodges, and still this, 2005-08. 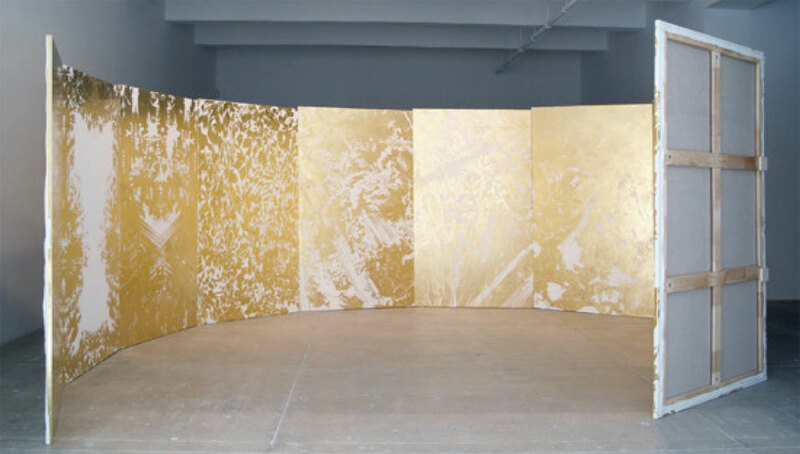 23.5K and 24K gold with Beva on gessoed linen in 10 parts, overall dimensions 200 x 185 x 89 inches.  Jim Hodgess and still this (2005-08), a dazzling gold-leaf painting referencing landscape and reflection that extends across an open circle of ten gessoed canvases;  Yayoi Kusamas Accumulation (1962-64), a historically important sculpture dating from a critical high point in the artists career and featuring a chair covered with hundreds of her signature bulging forms. Acquired jointly by the Museum and The Rachofsky Collection with the DMA/amfAR Benefit Auction Fund, these new acquisitions reflect the DMAs ongoing dedication to enhancing its contemporary art collection with works of singular importance. Considered to be among the most important museum holdings of its kind in the United States, the DMAs contemporary art collection has benefited tremendously over the past decade from the DMA/amfAR Benefit Auction Fund, which is supported by the annual fundraising event Two by Two for Aids and Art. Since its founding, the fund has allowed the Museum to acquire some 70 works of contemporary art, examples of which were recently on view at the DMA in TWO x TWO x TEN: Celebrating Ten Years of Two by Two for AIDS and Art. All three works will be featured in future installations of the collection. Additionally, new media works by Willie Doherty and Yinka Shonibare, both recently acquired through the DMA/amfAR Benefit Auction Fund, will go on view this spring and fall respectively, as part of the Willie Doherty: Requisite Distance and Performance/Art exhibitions. This striking painting contains many of the remarkable traits found in the work of South African artist Marlene Dumas, a painter of singular sensibility who is considered one of the most important figurative artists of our era. For Whom the Bell Tolls contains Dumass uncanny and haunting palette, her sophisticated and suggestive handling of paint, and her ability to concisely elicit a range of complex emotional associations. An example of the artists longstanding interest in portraiture, it also epitomizes her ongoing exploration of the relationship between the documentary impulse of photography and the expressive potential of painting. The source image for the painting is a close-up photograph of Ingrid Bergman from the soundtrack album cover for the 1943 film For Whom the Bell Tolls, itself based on the novel by Ernest Hemingway. The photograph has long occupied a place of pride in Dumass image bank, a vast archive of news media images and personal snapshots, and its invocation in this painting relates to Dumass interest in destabilizing images that have become iconic in forming cultural and personal identities of the 20th century. In For Whom the Bell Tolls Bergmans famous visage is made barely legible, even ethereal. Marlene Dumass work represents an important chapter in the rich history of photography-based painting. Her paintings have an unmistakably photographic sensibility overlaid with fluid brushwork and distortions of form, and a palette that oscillates between extreme saturation and spectral softness. In this way, Dumas has staked out a territory quite separate from earlier practitioners of photographically driven painting, such as Gerhard Richter and Sigmar Polke, both of whom are currently well represented in the DMAs collection. For Whom the Bell Tolls extends the DMAs holdings of photo-based painting with a work that exemplifies Dumass novel aesthetic of emotive power. One of the most exhibited and collected artists of his generation, and the 2008 Two by Two for AIDS and Art honored artist of the year, Jim Hodges began to create works of art based on traditional beauty and deep emotion during the late 1980s and early 90s, a time when such notions were thought by many theorists, critics and artists to be empty or even retrograde. and still this is one of Hodges most ambitious works and represents a culmination of his artistic and aesthetic concerns, uniting many themes and ideas from the artists nearly twodecade career. and still this encircles the viewer in a golden and enigmatic landscape-like composition that extends across a rounded arc of ten canvases of increasing height. Hodges has applied gold leaf to each of the canvases to create a layered scene of what appears to be silhouettes of trees and water, light and shade. At times these outlines appear as stylized arabesque patterns that could refer to the wallpaper of an interior space, or architectural details of an elaborate building. This mesmerizing, ever-changing interior and exterior landscape envelops the viewer in an environment that is transparently beautiful yet beyond full comprehension. This acquisition further enhances the strong collection of Hodges work in Dallas, both at the Dallas Museum of Art and in private collections. Blurring the boundaries of painting and of sculpture, and still this explores the significance and beauty of gold while it addresses the tradition of installation work that takes time honored materials and creates non-traditional objects. This imposing sculpture by Japanese artist Yayoi Kusama is a visually spectacular example of her ability to imbue the everyday with the psychological intensity of dreams and fantasy. One of the most significant artistic figures to emerge from post-World War II Japan, Kusama has investigated realms of the psyche and of human experience over the last fifty years in installations, sculpture, performances, paintings and works on paper. These works often rely on the repetition of organic forms with powerful and undeniable psycho-sexual content. In Accumulation Kusama places hundreds of phallus-like forms across and around the surface of a chair. She then painted everything a single neutral color, bleaching out any particulars of fabric or variation and leaving a strangely unsettling but also somewhat comical creature whose bumps and bulges register as both weird yet slightly ingratiating. Following in the footsteps of Merit Oppenheims fur-lined teacup, an icon of surrealism, Kusamas chair is less well-mannered and occupies our space much more aggressively, introducing itself unapologetically as the product of the subconscious. This is the first sculpture by Yayoi Kusama to enter the Dallas Museum of Art collection. With this acquisition, the DMA has deepened and extended its significant body of art from the 1960s with a work of undeniable historical importance.